Kent Sweezey with Western Reserve at Trackside training center. By mid-afternoon Monday, less than 24 hours after winning Sunday's seventh race with his 6-year-old Florida-bred mare, Imperial Sea, Kent Sweezey was on the road to Lexington, Ky., looking to add key pieces to his barn from the offerings at the Keeneland April Sale of Two-Year-Olds in Training and Horses of Racing Age. Traveling long distances in pursuit of quality Thoroughbreds – and the opportunity to broaden his knowledge and horsemanship – is nothing new for the 33-year-old trainer, who took the Irish National Stud Breeding Course in 2007 before moving to New Zealand and Australia to prep yearlings for sales. 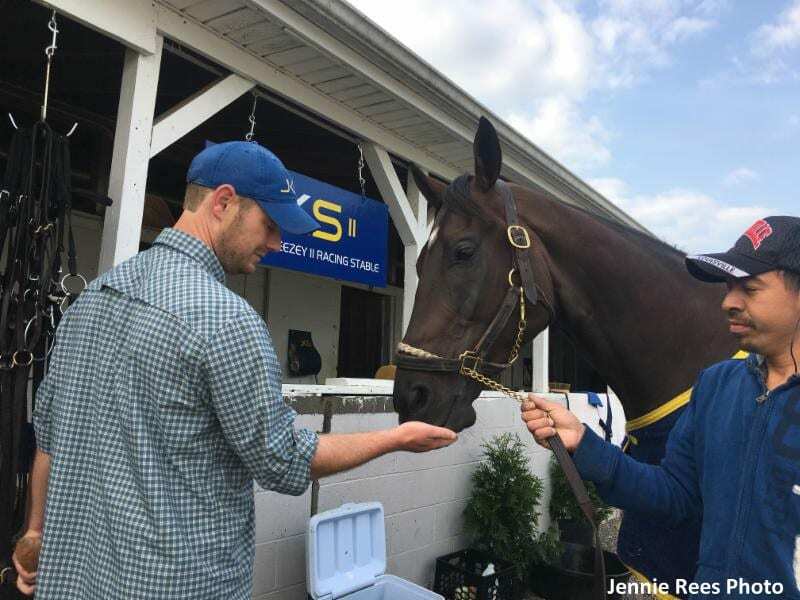 When he returned home, Sweezey went to work for his father, former Darby Dan Farm general manager Wayne Sweezey, at the family's fledgling Timber Town Stable operation in Lexington, Ky. It wasn't until trainer Christophe Clement visited Timber Town and asked the younger Sweezey about his plans that he decided to give the racetrack a try. Working under such industry standouts as Clement in south Florida, Eoin Harty in southern California and Jimmy Jerkens in New York allowed Sweezey to work with numerous stakes-winning standouts. The experiences also provided an impetus to set out on his own to see if he could acquire the knack to win races. Sweezey acknowledges leaving Jerkens' employ was a difficult decision after being around the likes of such Grade I winners as Travers champ V. E. Day, Twinspires.com Wood Memorial winner Wicked Strong and Breeders' Cup Classic runner-up Effinex. But his apprenticeship, so to speak, had run its course, and it was time to prove what he had absorbed. Now, in his second season at Tampa Bay Downs, Sweezey is starting to compile his own list of credits. Five recent victories have enabled him to move into 11th place in the Oldsmar standings with 11 victories, as well as earning him the Salt Rock Tavern Trainer of the Month Award. Several of Sweezey's recent victories have come at the maiden claiming level. It is no easy feat at times to convince an owner to drop their horse into lesser company while affixing a “for-sale” sign, but it can sometimes be a necessity when the objective is winning a race. Sweezey plans to race this spring and summer at Monmouth Park in New Jersey, while shipping to New York and other mid-Atlantic tracks when the opportunities arise. He is pointing the Robert S. Evans-bred-and-owned homebred 5-year-old horse Dover Cliffs to the Cliff Hanger Stakes on May 4 on the turf. He also hopes to find a lucrative spot for Warm, a 3-year-old filly bred and owned by Leverett and Linda Miller, who finished second by a neck in her most recent start on the grass to the Bill Mott-trained Aunt Hattie. Time will tell whether Sweezey can find a few more “horses to beat” of his own before horsemen return to Oldsmar next fall, but it seems likely he knows most of the good places to look. This entry was posted in People and tagged Florida horse racing, kent sweezey, tampa bay downs, wayne sweezey by Press Release. Bookmark the permalink.